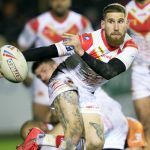 Tomkins extended the Catalans lead further on the half-hour with a penalty goal – Huddersfield holding Sam Moa down – before slick play down the right edge from Catalans saw Lewis Tierney score in the right corner. Tomkins hit the post with the conversion taking the score to 18-6 at the interval. Tomkins touched down in the 68th minute when Matty Smith’s kick to the right was allowed to bounce by Huddersfield and caused chaos. The ball bounced into the hands of Tomkins who raced around under the posts to score. He converted his own try to take the score to 26-6. With eight minutes remaining, Roberts chased Frawley’s smart grubber and managed to win the race to touch the ball down as Huddersfield rallied, but Darnell McIntosh hit the post with the conversion attempt to leave the score at 26-10.